Batch converts PDF to high quality DWG or DXF quickly and accurately. Outputs AutoCAD R13 - AutoCAD 2019 DWG/DXF files. Supports all versions of Adobe PDF file. Handles single page and multiple page files with ease. Converts the whole PDF document, a range of pages or one page into separate DWG/DXF files. Generates and optimizes vector entities like lines, polylines, splines, hatches, circles and arcs. Intelligent TrueType texts and line width recognition. Retains colors in the DWG/DXF file. Resizes the drawing by scale factor. Directly converts scanned PDF (Image PDF or raster PDF) without the need of raster to vector software. Works with and without AutoCAD/Acrobat. High performance, full featured and simple to use. 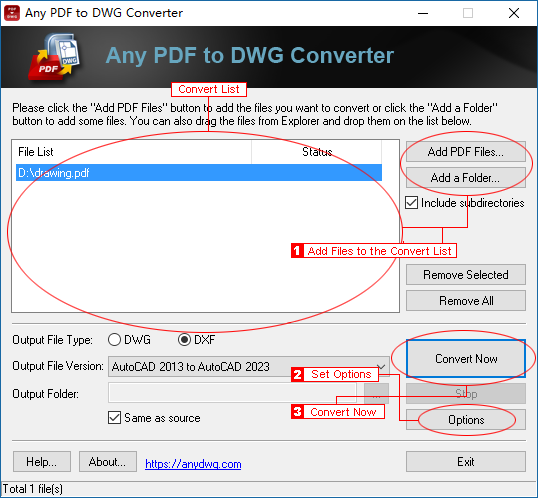 Run the PDF to DWG Converter, click the "Add PDF Files" button to add the PDF files you want to convert or click the "Add a Folder" button to add some files. Specify the output file type (DWG), output version and output folder. Click the "Convert Now" button to convert the PDF files to DWG.